This paper presents the analysis of the throughput enhancement possible using threshold-based multiuser scheduling in WiMAX OFDMA. We consider a point-to-multipoint (PMP) WiMAX network where base station (BS) schedules downlink packets for simultaneous transmissions to multiple users using the WiMAX OFDMA system. WiMAX OFDMA standard specifies several subcarrier permutation options, such as the partial usage of subcarriers (PUSC), full usage of subcarrier (FUSC), and the band adaptive modulation and coding (band-AMC) among others, for mapping the physical subcarriers into logical subchannels assigned to users by the BS schedulers. In this paper, we propose the use of threshold testing prior to the process of subchannel assignment to users by the BS scheduler, as a means of throughput enhancement. In the proposed threshold-based multiuser scheduling scheme, the BS scheduler selects at any time instant users whose channel gains in the available subchannels equal or exceed a predetermined energy threshold. Thus, only users who can maximize BS throughput on the available subchannels are assigned data transmission opportunities which enhance the BS data rate, albeit at the expense of fairness to users. We quantify the throughput enhancement of the proposed system and illustrate its benefits by numerical simulations. The IEEE 802.16 standard-based WiMAX network specifies OFDMA (orthogonal frequency division multiplexing access) as multiuser access method, where a base station (BS), in a point-to-multipoint (PMP) mode, communicates with multiple users simultaneously on different time-frequency resources [1–5]. Each subchannel in the OFDMA option of the WiMAX system comprises a set of OFDM subcarriers which may be mapped onto the frequency spectrum either sequentially or in a pseudorandom manner. In the randomly mapped system such as the full usage of subcarriers (FUSC) and the partial usage of subcarriers (PUSC), the subcarriers in a subchannel are taken from different portions of the spectrum either in a completely pseudorandom manner (FUSC system) or by randomly selecting different subcarrier groups, each consisting of adjacent subcarriers in the frequency spectrum, into a subchannel (PUSC system). In the sequentially mapped system such as band adaptive modulation and coding (band-AMC), only subcarriers adjacent in the frequency spectrum are included in a subchannel. In this paper, we consider the use of threshold-based multiuser scheduling in WiMAX OFDMA. Threshold-based scheduling is applicable to all the WiMAX subcarrier permutation options, but due to analytical difficulty we will later focus on the band-AMC in our analysis. Motivation for the threshold-based scheduling consideration is the fact that, in OFDMA systems, user channels experience deep fades frequently, therefore the regular WiMAX OFDMA scheduler based on FUSC, PUSC, or band-AMC systems would be forced to assign subchannels to users when their channels experience deep fades, degrading the BS throughput significantly. To optimize BS throughput in such case, we propose in this paper the use of threshold-based multiuser scheduling, where users first undergo threshold test before the regular scheduling policy of the BS is applied. The threshold-based selection method was proposed by Sulyman and Kousa in  for diversity combining problem in a single-user transmission system, and has been widely studied in the literature [7–10]. In the context of multiuser scheduling in WiMAX network, we recently discuss the use of threshold-based multiuser scheduling, where a BS scheduler uses the energy threshold criterion to select the users to be scheduled for downlink transmission at any time instant in a WiMAX OFDMA system . The advantage of this scheduling strategy is that, at any time instant, only users whose channels are strong enough to sustain the network operator's target data rate are scheduled. This allows operators to maximize system throughput and is more useful for non-real-time traffic, which are delay tolerant. Scheduling of data transmissions to users with temporarily weak channels can wait until their channel conditions improve. Efficient utilization of the resources for non-real-time traffic as proposed in this paper frees up bandwidth resources for real-time traffic and optimizes overall network resource utilizations. In this paper we define a performance metric called the throughput gain and analyze this metric. We show that the throughput gain achieved in the threshold-based multiuser scheduling scheme compared to the regular scheduling system increases as the threshold level is increased. 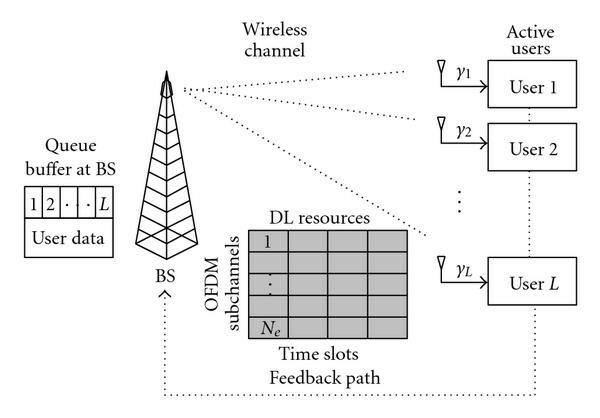 Consider a threshold-based downlink scheduling scheme in OFDMA system where a BS scheduler schedules users for downlink transmission, out of total of L users, whose SNR on the th subchannel meet or exceed a predetermined energy threshold, th. The available subchannels in the OFDMA system are distributed among the users (tagged here active users) whose SNRs passed the threshold test, using the regular BS scheduling policy. The number of users, , satisfying the threshold requirement at any time instant is not fixed but variable in correspondence with the user channel statistics. The specific realization of could take any value from the set , at each scheduling period. Let denote the instantaneous SNRs of the L users fed back to the BS. At any time instant, the BS scheduler schedules the users whose SNR satisfy , for downlink transmission, as illustrated in Figure 1. Downlink scheduling in WiMAX OFDMA networks. where . This threshold definition is tagged the normalized threshold , and it insures that in the worst case scenario at least one user will be scheduled for service, while in cases when the fading is not severe such that all users meet or exceed the threshold, they are all scheduled for service. Thus, only users with good SNRs, , to sustain a desired data rate on the subchannels are scheduled at any time instant . Network operators can therefore use the threshold definition to guarantee a desired data rate on the overall network, optimizing the system throughput. Threshold-based multiuser scheduling for reduces to opportunistic scheduling, and, as is reduced, in the range , more users are scheduled per channel use, introducing some fairness. The case corresponds to the regular underlying scheduling policy of the BS used as reference. The goal of an OFDMA scheduler is the effective distribution of the OFDMA subchannels among the active users in the cell such that performance and costs are optimized. WiMAX OFDMA standard describes several subcarrier permutation options such as FUSC, PUSC, band-AMC, and, for the grouping of the physical subcarriers into logical subchannels that represents the unit of resource allocation to users by the BS schedulers. Threshold-based scheduling is applicable to all these subcarrier permutation options and can be used with existing scheduling schemes implemented in the WiMAX system. However, for each of the various subcarrier permutation options, the statistics of the subcarriers grouped into a subchannel differs. Thus, it is somewhat difficult to develop a general analysis valid for all of them. To demonstrate the potential benefits of the proposed threshold-based OFDMA scheduler analytically, we choose a representative subcarrier permutation option with tractable subchannel statistics, the band-AMC scheme, and we develop analytical tool for estimating the performance of the proposed scheme. In this analysis, we examine the throughput gain achievable using threshold-based selection for multiuser scheduling in a WiMAX OFDMA system employing band-AMC subcarrier permutation option. Assuming a burst of length n OFDM symbols. At any time instant, the users feedback to the BS their SNR in each subchannel, obtained using the assigned pilots in the subchannels. The threshold-based scheduler at the BS then conducts threshold test to select the users whose SNRs, , are above threshold in the th subchannel and schedules them in turn (in round-robin manner, for example) for service on that subchannel for n successive OFDM symbols transmitted in a burst, where . Without loss of generality, we assume that in the analysis. However, in practice, there would be cases when <n for a given subchannel. For cases when for a given subchannel, we assume that the BS scheduler assigns the remaining time-frequency transmission resources opportunistically by allocating them to the user with the best SNR in that subchannel, as illustrated in Figure 2. The impact of this assumption is that the throughput enhancements estimated in the analysis are less than what would be obtained in practice using threshold-based scheduling in WiMAX OFDMA, as shown later in the simulation results in Section 3. Threshold-based multiuser scheduling in WiMAX OFDMA. The throughput gain defined above gives a useful measure of the throughput enhancement introduced by the threshold testing in WiMAX OFDMA system in comparison to the regular scheduling policies of the BS scheduler since , where denotes the SNR of the scheduled user (SNR of service) at any time instant, and denotes the average SNR in the cell. In the ensuing analysis, we consider that all users experience same average SNR which is applicable in multiuser access problem where user channel statistics are i.i.d. where denotes the pdf of the random variables . where denotes the probability that there are n users whose SNR equal or exceed . where is given by (11). In Figure 3, we plot the analytical results for the per subchannel throughput gain of threshold-based multiuser scheduling schemes in OFDMA systems, using (11) and (17). Simulation results are also included in this figure for reference. For the illustrations in the figure, we assume round-robin as the underlying BS scheduling policy upon which threshold testing is applied. 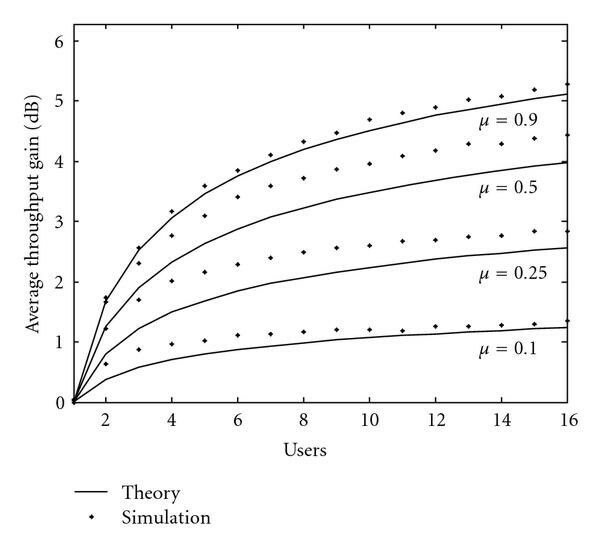 Both the analytical and simulation results in the figure agree closely and indicate that a multiuser scheduling system where users SNRs,  , undergo threshold test before scheduling, would enhance system throughput significantly as the threshold level is increased in the range (0%–100% threshold). The enhancement becomes very significant when the number of users serviced per base station sector is large, taking advantage of the randomness of the user channel statistics. For example for the 16-user system in this figure, about 2.5 dB throughput gain per OFDM subchannel can be achieved for moderate threshold level such as , while about 5 dB gain per-subchannel can be achieved with high threshold level such as . 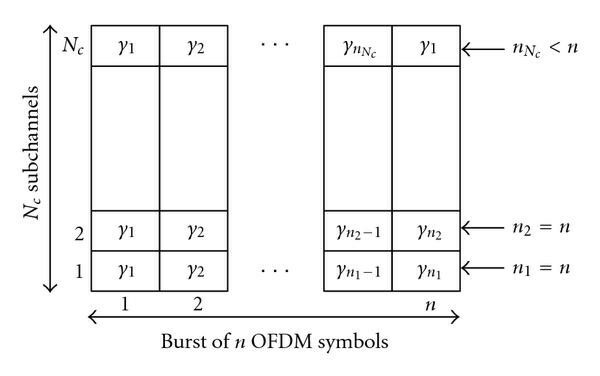 These gains can be very significant in systems with large number of subchannels per OFDM symbol (e.g., IEEE 802.16e OFDMA option with 32 subchannels ). Throughput enhancement using threshold-based multiuser scheduling in WiMAX OFDMA (16 users per BS scheduler). Notice that at low threshold level, more numbers of users are scheduled per OFDM symbol, allowing the BS to exhibit more fairness to the users in the scheduling policy, while at high threshold level less numbers of users are scheduled per OFDM symbol, allowing the BS to exhibit less fairness to the users. There is therefore an important tradeoff between fairness and throughput enhancement in the proposed scheme. We conduct an optimization search for this tradeoff for the cases of sixteen, eight and four users per BS scheduler, and the results are as summarized in Figures 4 and 5. In Figure 4, we plot the average number of users scheduled in the proposed scheme, , while in Figure 5 we plot the average throughput gain, , for threshold range . It is observed from these figures that while the throughput enhancements increase with , the average number of users scheduled decreases with it. An optimum value of thus exists for each case that allows the BS scheduler to achieve reasonable throughput enhancements while maintaining good level of fairness to the users. Using these two figures, network operators can plan a desired throughput enhancement (in dB) in their network, and be able to estimate the level of user fairness compromised doing so (in % of subscribed users serviced per BS downlink transmission). 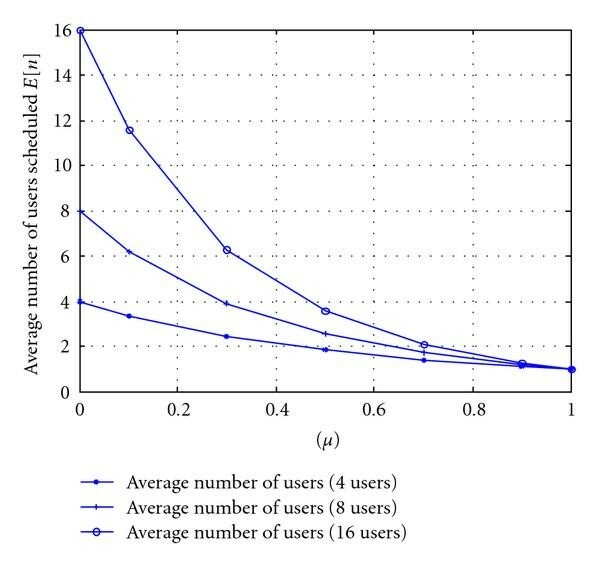 Average number of user scheduled per transmission with respect to threshold level (4, 8, and 16 users per BS scheduler). Throughput gain with respect to threshold level (4, 8, and 16 users per BS scheduler). Examples. Suppose that a BS scheduler desires to enhance its throughput while exhibiting 50% user fairness for the 4-user case in Figure 4, which corresponds to . The value of that achieves this is obtained from the figure as . Using this value of to read the corresponding estimate of the throughput enhancement for the 4-user case from Figure 5, we obtain . 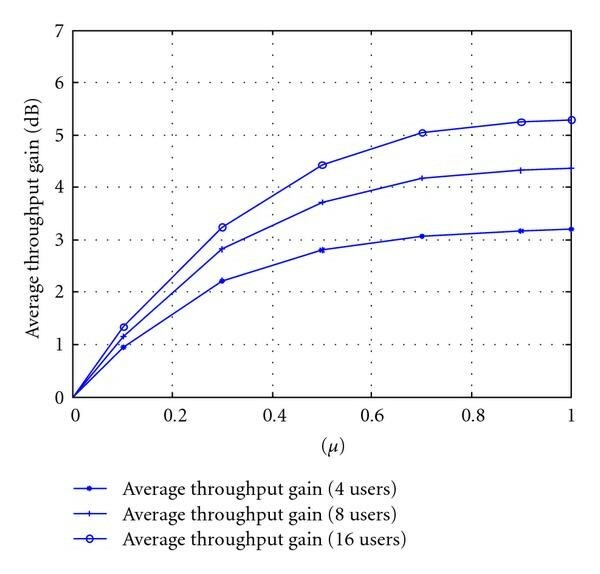 Similarly suppose that it is desired to enhance the BS throughput while exhibiting 56% user fairness for the 8-user case in Figure 4, which corresponds to . The value of that achieves this is obtained from the figure as . Using this value of to read the corresponding estimate of the throughput enhancement for the 8-user case from Figure 5, we obtain dB. Finally suppose it is desired to enhance the BS throughput while exhibiting 80% user fairness for the 16-user case in Figure 4, which corresponds to . The value of that achieves this is obtained from the figure as . Using this value of to read the corresponding estimate of the throughput enhancement for the 16-user case from Figure 5, we obtain . Going higher above the threshold level illustrated for each of the cases in this example achieves more throughput enhancements but at the expense of user fairness, since less number of users will be scheduled per OFDM symbol transmitted by the BS. This paper presents the analysis of the throughput gain achievable in a threshold-based multiuser scheduling scheme in WiMAX OFDMA systems. We consider a point-to-multipoint (PMP) WiMAX network where BS schedules downlink packets for simultaneous transmissions to multiple users using the WiMAX OFDMA system. In the threshold-based scheduling scheme, the BS scheduler selects at any time instant users whose channel gains in the available subchannels equal or exceed a predetermined energy threshold. Thus, only users who can maximize data rate on the available subchannels are scheduled, enhancing the BS throughput. We quantify analytically the throughput gain per subchannel, provided by the proposed scheme and also present simulation results to verify the analysis. Both analysis and simulations indicate significant enhancements in the system throughput when large numbers of users are serviced per BS scheduler. We also found that throughput enhancements in the proposed scheme increases with the threshold while average number of users scheduled per transmission (fairness criterion) decreases with it. Therefore we illustrate methods to obtain a threshold that achieves a reasonable balance on this tradeoff for different numbers of users per BS scheduler. It is expected that the preliminary results presented in this paper will motivate further interests on the benefits of the proposed scheduling scheme in WiMAX networks. Specifically, we hope that the proposed scheme could provide a simpler, yet efficient, alternative to the weighted round-robin (WRR) scheduling scheme currently implemented in WiMAX networks [14, 15]. The author thanks the editor and all anonymous reviewers who examined this paper, for their constructive inputs. The author also thanks the research centre at the college of Engineering, King Saud University (KSU), for facilitating this work. This work is sponsored by the Deanship of Scientific Research, KSU, Riyadh, Saudi Arabia, under Grant no. 150117.